GLIN was referring to Lake ERIE, Lake HURON, Lake MICHIGAN and Lake ONTARIO, a set of four lakes of significant size that, along with Lake Superior, comprise the original five Great Lakes; perhaps they were also including Lake Champlain, which was given the designation of the sixth Great Lake in 1998. Lake Superior has a volume of 2,900 cubic mi (12,100 cubic km), the largest-volume lake in North America, and the third in volume worldwide. The average depth of Lake Superior is 483 ft (147 m), with the deepest portion reaching 1,332 ft (406 m). Its length is 350 mi (563 km) and its breadth 160 mi (257 km), with a shoreline that, including its islands, measures 2,726 mi (4,385 km). This lake is 600 ft (183 m) above sea level and has an average temperature of 40 degrees F (4 degrees C). The lake’s drainage basin, the area of land where streams and rivers drain into the lake, is 49,300 square mi (127,700 square km) and is located in MICHIGAN, MINNESOTA, WISCONSIN, and Ontario, Canada. In Canada, the drainage basin rests on rocks that are 1 to 2 billion years old. The Great Lakes formed slowly; 600 million years ago, a shallow sea covered that area, and sand and silt deposited there gradually compressed into limestone, sandstone, and shale. The sea eventually dried up and about 1 million years ago, thick glaciers advanced and retreated over the land, carving large holes in soft sandstone and shale. Approximately 10,000 years ago, the last glacier retreated. As the Earth warmed up, the resulting water—called meltwater—filled the holes carved out of sandstone, and the Great Lakes were formed. Lake Superior, in particular, has low levels of dissolved minerals; hard Precambrian rocks of the watershed beneath the lake are not easily dissolved. French explorers named the lake Lac Superieur, meaning “Upper Lake.” They chose this name because Superior is located above Lake Huron; its waters flow into Lake Huron through St. Mary’s River. The Native American name for this body of water was Kitchigummi, meaning “great-water,” mentioned in a wellknown song, “The Wreck of the Edmund Fitzgerald,” by Gordon Lightfoot. This song highlights the propensity of shipwrecks in Lake Superior, in part because of its ferocious waves; a length of shoreline is known as Shipwreck Coast and a nearby area is called the Graveyard of Ships. Although the shipwreck connection provokes many tales of ghosts, much life abounds in its waters; 78 species of fish have been observed in Lake Superior, most notably the whitefish and lake trout. This fish population was reduced because of overfishing; the introduction of the sea lamprey, an eellike creature, contributed further to that reduction. Effective measures, however, have been taken to reverse this trend in fish stocks. Lake Superior has a retention time of 191 years, which means that, on average, a molecule of water that enters the lake’s confines will remain there for 191 years. Therefore, contaminated water that enters the lake will remain there for a significantly long time as well. Nevertheless, Lake Superior has not been subjected to the same levels of pollution as other Great Lakes, in part because its shorelines are more sparsely populated than those of other lake regions. 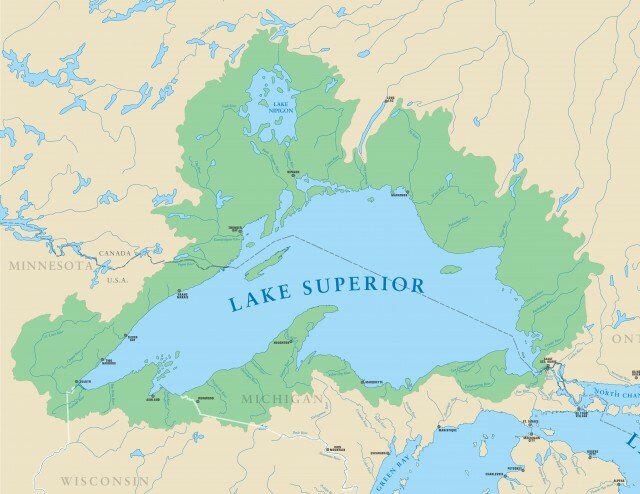 The United States and Canada are therefore using this lake as a model in restoration and have created a program to restore and protect the Lake Superior Basin as the basis for their overall Great Lakes restoration plan. The plan focuses on the entire air-water ecosystem of Lake Superior.